You can think of every place as having its own rhythm — the attitudes local people inhabit as they move through their day, the symphony of sounds and smells that define the larger cities, the chorus of endemic flora and fauna infusing natural landscapes. In Colombia, that rhythm is the one you feel pulsing through the streets with a cumbia beat. It’s the Colombian version of joie de vivre evident in the people here, a kind of stubborn optimism born out of hard times, manifest in the genuine friendliness shown to visitors. And it’s most definitely the vibrant color and flavor palette of the national cuisine, served up in markets, restaurants, and street stands by people who love these tastes almost as much as they love to share them with others. On your trip to Colombia, if you’re looking to tap into the true rhythm of the country, here’s where you should start. One of the best first steps to getting to know a country is to explore its food. 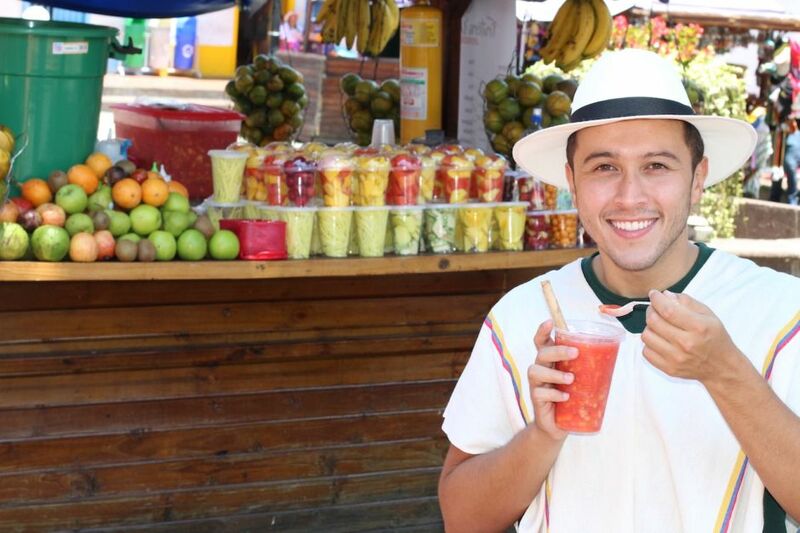 For a taste of daily life in Colombia, check out Paloquemao Market — the capital city’s biggest. It’s a prime location to people-watch, snap photos, buy flowers, and sample exotic fruits. As shiny grocery stores enter the scene, Paloquemao stands as a symbol of authenticity and unpretentiousness, in addition to its status as a portal to Colombia’s best food traditions. Be sure to try the chontaduro (peach palm) with salt, a deliciously refreshing lulada (sweetened juice of the lulo fruit), the weird-but-wonderful granadilla (like a sweeter version of passion fruit), or the classic pitaya (a relative of dragon fruit). Paloquemao is where professional chefs from famous restaurants buy their ingredients and where five-star hotels get the stunning flowers they use to decorate their properties. It’s open daily, and there are plenty of tiendas where you can grab a full meal. If you like to party, Cali is going to be your new favorite. While smaller than Bogotá, it’s the most populous city in the country’s southwest. It breathes music — salsa, specifically — and every day is a party (well, every night, at least). No other Colombian city offers a deeper immersion into dance culture, and caleños (people from Cali) are the reason the city is known as la sucursal del cielo, roughly translated as “next to heaven.” In other words, if you don’t know how to salsa, it doesn’t matter. You can expect to get pulled in anyway. Tip: Don’t leave without trying some aborrajados, a delicious fried plantain-and-cheese snack you can’t miss! Cartagena is one of the most popular destinations in Colombia, and with good reason. While it’s a relatively small city, its rich history is forever engraved in its architecture. In one fell swoop, you can visit a colorful colonial village, a church that holds the remains of a saint, an Inquisition palace (now a historical museum), and a war wall with scars from battles of the past — they’re all within walking distance of each other. You can skip the local beach; architecture and history are the city’s real draws. But if you’re looking to hit the sand, hop a quick boat ride to one of the nearby islands. The beaches at Barú, Playa Blanca, and the Islas del Rosario (to name a few) won’t disappoint. The tiny town of Ráquira, despite all its made-for-Instagram color palette, is somehow well-hidden in the department of Boyacá, just north of Bogotá. While it’s getting more popular, it’s still mostly frequented by travelers stopping on their way to the better-known Villa de Leyva. Ráquira is also considered the artisanal capital of the country and is a great place to find authentic, original souvenirs to take back home. One of the nicknames of the river Caño Cristales is “liquid rainbow,” and the picture that should paint in your mind is spot on. The water’s five distinct colors are created by certain plants and are observable during certain times of the year. The most stunning of them all is a rich, deep red, and the colors stay separate, like melted crayons. 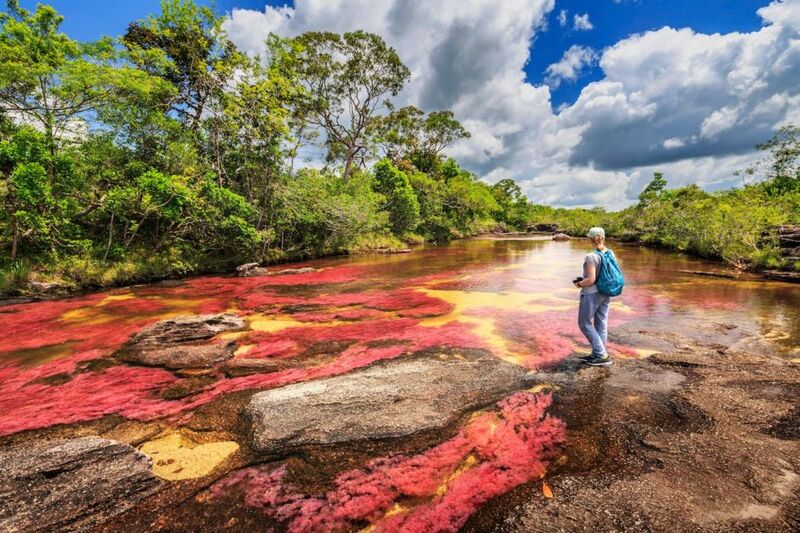 Caño Cristales is considered by many to be the most beautiful river in the world…when this phenomenon is active. Make sure to book your trip between the dry and wet seasons, somewhere between September and November. Tip: While you’re in Sierra de La Macarena National Natural Park, you’ll also be surrounded by amazing quarzite rock formations (about 1.2 billion years old!). Make sure to spend a couple days in the area to explore this unique landscape. Stargazers take note: The Tatacoa Desert has year-round clear skies and an observatory that’s open to the public. Come here to feast your eyes on billions of stars, their light streaming through the universe for millennia to meet you in this precise place, at this precise moment. If you’re more into feeling the past with your hands, stop into the nearby village of Villavieja and explore the paleontological museum — it’s filled with archaeological artifacts and fossils. And if your visit is all about the landscape, don’t forget the desert itself. There are areas of white and red sand, so your experience won’t be complete until you’ve seen both! This is perhaps Colombia’s most famous nature park. Tayrona straddles both beach and rainforest zones, where amazing wildlife and incredible history claim the same space. It’s one of those places that’s so majestic you can’t help but stop and ponder the miracle of your existence on this planet. While you can’t swim here, it’s the perfect spot for some yoga and a hike to center your inner self. You can also explore the area’s cultural legacy at the archaeological site El Pueblito. You’ll learn all about ancient indigenous cultures like those of the Tayrona people (source of the park’s name) — a must-visit for those interested in pre-colonial history. Note: If that’s you, make sure to also check out the much larger Sierra Nevada de Santa Marta National Natural Park, which lies in the mountains just south of Tayrona and includes major sites like Ciudad Perdida (literally “Lost City”). 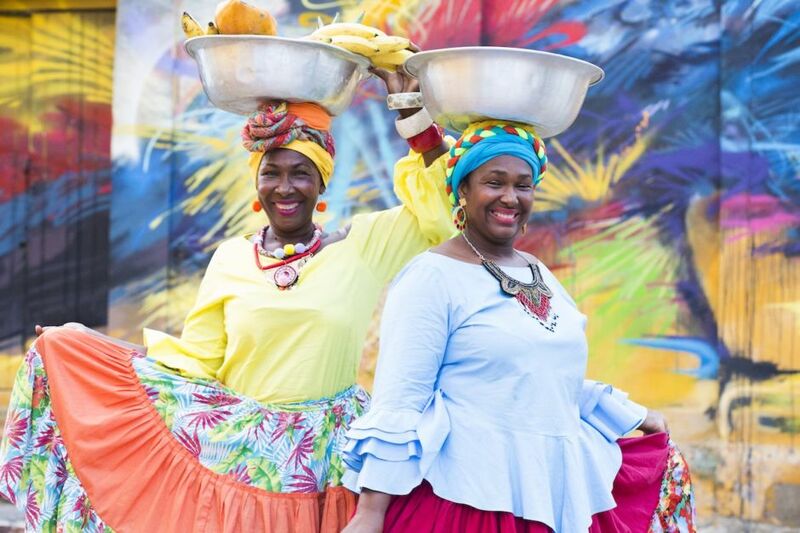 In both of these parks, you’ll be able to interact with Colombia’s ancestral cultures in real life, outside the confines of museums. Arepas rellenas and empanadas, which can be bought anywhere you go. They’re the most popular street foods and have regional varieties. One of the best? The arepa de huevo in Cartagena. The best side — and sometimes main — dish is patacón, or crispy fried plantains. It’s prepared on its own or topped with anything from fresh cheese to sautéed meat, and is considered a national treasure. 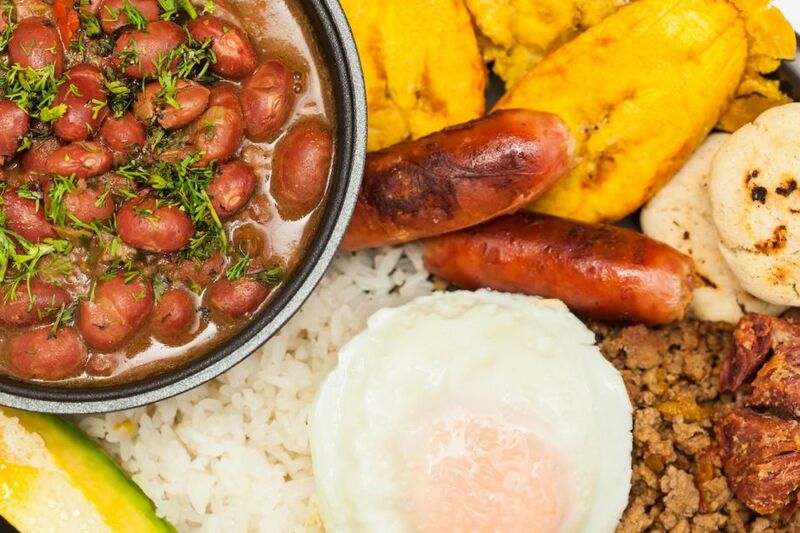 Other traditional dishes include ajiaco, bandeja paisa, and tamales. Try them all (maybe not at the same time). And last but not least, you’re no doubt aware that Colombia is known for its coffee, right? One of the things that makes it so world class is that it’s grown in volcanic soil and hand-harvested so that only perfectly ripe cherries make the cut. Be sure to grab a bag to take home if coffee is your vice of choice. And if you need something to pair it with, by now you should have a few ideas.